You’ve seen and heard of a few ways to store fabric in our earlier studio organization posts this month. Today’s post is about Fabric Storage and we have an awesome give-away for you too. Join our link party for your chance to win. This is one of my piles of stored Freespirit fabric in yummy pastels… I am NOT as neat as Anne Sutton… what can I say! I also store by color like so many do. I interviewed Lynda Hall of “Primitive Pieces by Lynda” on January 23, 2012 and we talked color and sorting of it (listen here). I generally sort like Lynda does big groups of color together. Red is palest of pinks shaded up to deep red. Those go in bins I can pull off the shelf to easily work with. Primary colors of Red (pink to deep red), Yellow (pale yellow to orange to brown), Blue, Green, Purple, Neutrals, Black. For the most part shaded in the area they are stored. 1930s fabrics .. as I just can’t seem to put those in with the others. Novelty prints that are heavily themed, such as Christmas as it just does not go well in a spring quilt.. wink! And yes.. a few coveted lines, like above, are kept together. Another HUGE question everyone asks is how to sort scraps. For this I turned to Bonnie Hunter the “Scrap Queen” extraordinaire and a good friend of mine. 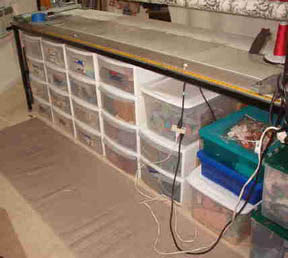 Bonnie told me in this past December she re-organized her strip bins. She also made adjustments to how she works with things. She wrote about it all at this post … love the post name “Fabric Herding!”. Here is a link to Bonnie’s original post that started the whole scrap sorting thing. She wrote this back around 2000. 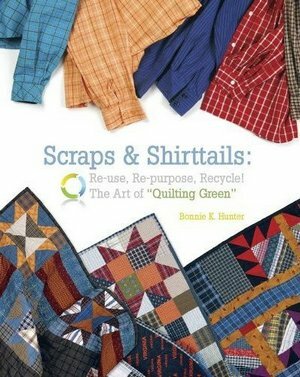 Bonnie’s first book also has a lot of info about Scrap management called Scraps & Shirttails: Reuse, Re-purpose, Recycle! The Art of “Quilting Green” by Bonnie Hunter. How do you store your fabric? Does it work for you? If not, what will you change first? – Share your comments below or enter our link party. Thanks to everyone who dared to share their studio “Before” photos in our earlier post this month. It was so much fun to see all of your studios. Thanks also for the tips and advice shared in the comments too. We wanna see your stash! Well you can, thanks to the fine folks at Polar Notions who have created the perfect solution to organize your fabric stash. Create your own “Mini Bolts” with these solid, acid-free, reusable plastic Storage Sheets. The “Mini Bolts” come in two sizes: 11 3/4″ x 7 1/2″ and for fat quarters 6 3/8″ x 4″. We have two sets of 10 of each size to give away to two readers that share their stash photos in the link party below. How to Enter: Create a NEW blog post on your own blog, take a photo or several photos of your stash for your blog post. Link back to this post, or to the Learning Center main page – there are graphics you can use, telling your readers that you’re sharing your stash for a chance to Win!. Come back to this page and add your post to our Link Party below. The two winners will be randomly selected Thursday, March 1st. If you have questions or need help joining the link party, contact Michele. I sort and fold my fabrics by color. Then I put my cut squares and strips into seperate bins. 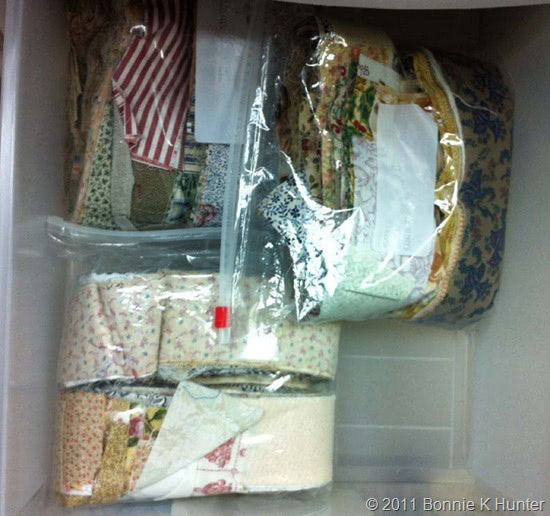 all Jelly rolls are in another bin.And like Bonnie Hunter–I have bins of scraps,seperated by size and color. 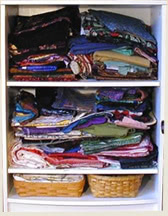 This is my method –so I know where each is without having to hunt to find fabrics. I have a question that so far have not seen anyone address. 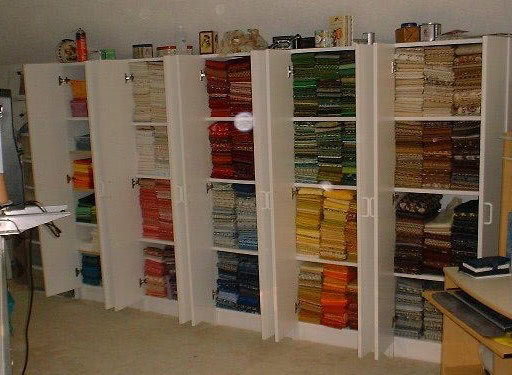 I too like to sort by color, it makes it easier for choosing fabric for a certain quilt. But how do you sort multicolored fabric, when 1 color is not the focus? @Susan – I group my multicolored fabrics into hue – light, medium, dark, and sandwich them as their own categories in between the colored fabrics. Generally I squint my eyes and whatever color I see is where it goes. 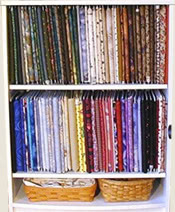 I linked to an old post about my sewing room but it does not include a three-drawer unit next to the TV that has all my Bonnie Hunter-style cuts – I cut 1.5″ strips, 2.5″ strips, and 5″ squares. It’s been a great way to remember what I have in my stash to go through and cut a bit from each fabric as I use it. My method is a joke right now. I DO have fairly neat mini bolts on the shelves of yardage, but not in any sort of color organization. My scraps–are all jammed into 2, yes TWO, 30 gallon totes. I’m working on culling them, but I HAVE SO MUCH! And no time to sit and cut. Anyone want to come have a culling party with me? I’ll make sure we dont’ run out of wine or chocolate!! 30’s.. Like you, I couldn’t divide these babies up. Tote for Christmas fabric, as well. Tote for Eye-Spy (AKA Novelty) fabrics. Little bins for 2-1/2 strips… colored coded. I have fabric EVERYWHERE! Every now and again I will try to organize my quilting fabrics neatly folded in boxes turned onto their sides by color. But right now they are stacked in general color groups on the guest bed and pool table. I do sort by color for the most part. But, just like you, I keep my 30’s stash separated out, LOL. 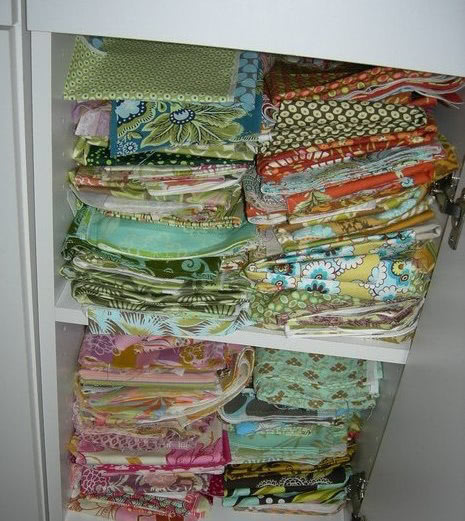 Well, being a newbie quilter, I don’t have a stash like y’all! Besides, I just recently moved out of a 5th wheel trailer, where every spare inch (and ounce of weight) mattered. A LOT. In the trailer, I couldn’t really keep much stash at all, but the Insulbright and batting that I was able to purchase in lots was kept outside, in a Rubbermaid deck box! Now that we live in a house again, I have a whole bedroom devoted to sewing! Yippeee!! So, basically, I took one of the poles out of the closet (the lower pole) and put two tall bookshelves in there, each one has 5 shelves, and I squeezed a little 3-shelfer in, catty-corner on the side. In those bookshelves, I have all the fabric yardage, sorted (mostly) by color groups, some groups, like all the flannel, together in pretty baskets I’ve turned on their side, so the top is actually facing out & I can see into the basket at a glance. I have been able to move the embroidery thread out from under the living “room” sofa up onto thread racks hubby has hung on the wall for me, so all my colors are within easy reach (and I can always see when I’m running low on a color). The batting & Insulbright? Well, I’m ashamed to say it, but they are still in their original tote, but now they live under the window instead of outside! Progress is slow, but at least it’s progress! Well Pat, I sort my fabrics in many different ways. I have one collection of fabric’s that are dedicated to specific projects. They are sorted by projects. Then I have ton’s of scraps and they are sorted in categories like batiks, solids, floral’s and so on. Each category is broken down into colors. When it’s all organized it’s easy to find what I’m looking for, but when I’m working on scrappy projects I mess it all up real quickly and it takes me while to get things back in order. I need to follow the kindergarten rules of put things back in their spot when I am done playing. How you organize by project? 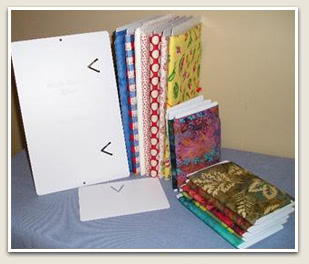 I have whole kits made up for quilts how would you get those into your purging/cleaning? I put my fabric in plastic totes by color. But the totes are getting so full I am cramming them into the totes. I pretty much sort my fabrics the same way as mentioned above. Last year I folded and sorted all my fabrics and placed them on shelves but I haven’t sorted them out by color yet. The FQs are all in a glass front cabinet and sorted by color, so they are a nice focal point in one cornor of the room. I’m terrible at not putting things away right away and they pile up on flat surfaces when I need to audition fabrics. 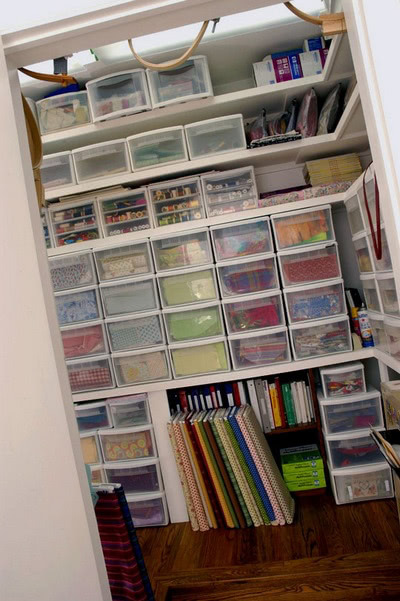 I used to have mine organized by type of fabric and then by size. I finally gave in and organized the quilting fabric of less than a yard by color. It is in either rubber made containers or drawers of one dresser. I really don’t want it where it can be seen. I have a dedicated room for sewing but I don’t want the fabric to be in view and I want to be able to pull everything of a color out at once. I can’t do that if it is in stacks. So, I think mine works for me. What I need to do is corral the projects I have going on better.